There are times when certain things do not go as we expect, this could also happen to your blog. The articles we have made with difficulty could be lost due to server errors or other causes which we do not expect before. In Drupal, Joomla or WordPress, we find a database that stores all data from a website or blog, and we just backup the database to backup data such as articles and other configurations. 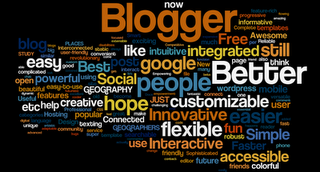 Going to "Dasboard" in your profile on Blogger. Click "Settings" on the blog you want to backup. In the "Basic" settings, click "Export blog" link. Click the "Download Blog" link. You can save a formatted xml file wherever you like and click "Save". If something is happening with your blog, you can import the files you have downloaded earlier, and all articles will be back as when you backup your blog. This is my Twitter account. Here you can find a variety of information relating to all things when I surf the Internet. You can find the latest news related to my software, like any new updates, errors or tips on how to use my software correctly. Or you can get news related to my software. Understandably just because sometimes I do not have much time to make the article, so I often use Twitter to update the latest news from all of my products. It seems from year to year, Drupal become more popular. In the year 2009, Drupal is very popular in the eyes of the government. There's news that the Department of Commerce plan to switch to Drupal. In searching for information, the Department of Commerce to ask the vendor from Drupal to provide information on how Drupal can host several websites with multiple domain names and with one domain name. Of course you know that Drupal is supporting it all. As we all know that the White House also had to use Drupal. Drupal does have advantages compared to other CMS, and this is desperately needed by these institutions, such as: supporting social networks, the user management and permissions features, easy to create large complex web sites, and many other advantages that make many government agencies switched to using Drupal. Drupal is the inventor of Dries Buytaert, Drupal is an open source CMS written in PHP programming language. The word "Free" apparently does not exist in Microsoft dictionary. Yes Microsoft is very rarely give software for free they are made. Their software such as Windows OS or Microsoft Office requires that anyone who wants to use it to pay a large amount of money. However, in order to maintain their dominance as the giant software company, then they must be willing to give a very good software for free, it is also for their long-term interests. Would be expected that more and more developers who create software for their operating systems, namely Windows. Software that I mean here is the Visual Studio 2008 Express Edition. Visual Studio 2008 Express Edition is a tool to create innovative applications. To use it is so easy, even for beginners though. Visual Studio 2008 Express Edition supports writing of code into some favorite programming language, like C#, C++ and VB. The minimum operating system supported by Visual Studio 2008 Express Edition is Windows XP SP2. Download Visual Studio 2008 Express Edition.